Because Newcastle was the second settlement outside Sydney on the Australian mainland and the church building was officially founded, the building is notable for the length and uniqueness of its history. Christ Church had its beginning in 1804 when, among Lieutenant Menzies’ instructions from Governor King was one saying, “You are to cause the prayers of the Church of England to be read with all due solemnity every Sunday.” This instruction was faithfully obeyed by the Military. Legend has it that, by 1812, there was a slab hut available to house the people during the reading of the prayers and that it was on the site of the present Cathedral. The first church was erected in 1817 “by Order of Governor Macquarie”. There was no resident clergyman and the church was one of the Government buildings. In August 1818 at a service conducted by The Rev’d William Cowper of St Phillip’s Church, Sydney, Governor Macquarie himself named the little convict built church Christ Church. With considerable alteration and constant repair, the building survived to become our first Cathedral. By Letters Patent of 25th June, 1847, Dr William Tyrrell became the First Bishop of Newcastle and by those same Letters Patent in these terms, Newcastle became a city. And so, our City was born. pounds was offered to the winning design or the winners could supervise the erection of their own building. The winning architects, Terry & Speechly of Melbourne, opted for the premium and their involvement with the project ceased. The North American architect, John Horbury Hunt, was appointed Supervising Architect. requested of and submitted by Horbury Hunt were adopted. 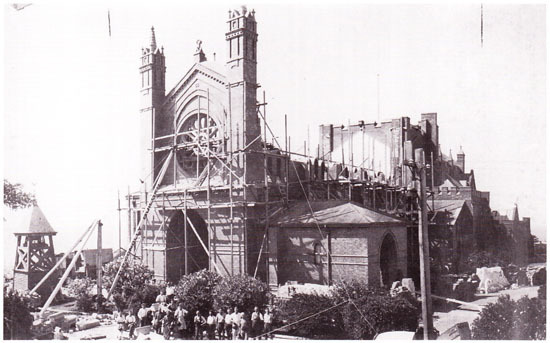 As a matter of urgency, Hunt was first requested to build the Pro Cathedral which is now the Cathedral Hall and the congregation moved into this building in 1884 while the old Church was demolished and the foundations of the new building were laid. Still the project was beset with difficulties. There had been serious miscalculations of the cost of the project, work was suspended in 1893, law suits followed and the building lay derelict until the end of the century. Horbury Hunt, after being retained by the Cathedral for 26 years, 14 of them as Architect, was dismissed. With the arrival of Bishop Stretch as Dean in 1900, the project revived and the plans of Mr J H Buckeridge of Sydney were adopted to roof the nave and render the building suitable for divine worship. Since then the building has been expanded by chapels and vestries, raised in height and filled with treasures. Most of the expansion was the work of the Architect, F G Castleden. The final addition of the great tower and bells in 1979 and its Consecration in 1983 completed the building which, as it stands today, is one of the great Cathedrals and most imposing buildings in Australia.